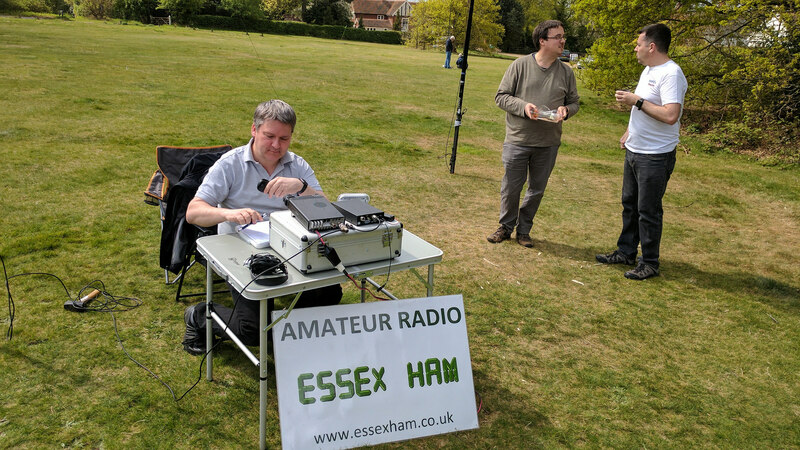 Sunday 23rd April St Georges Day provided a good excuse to play some radio with Essex Ham. 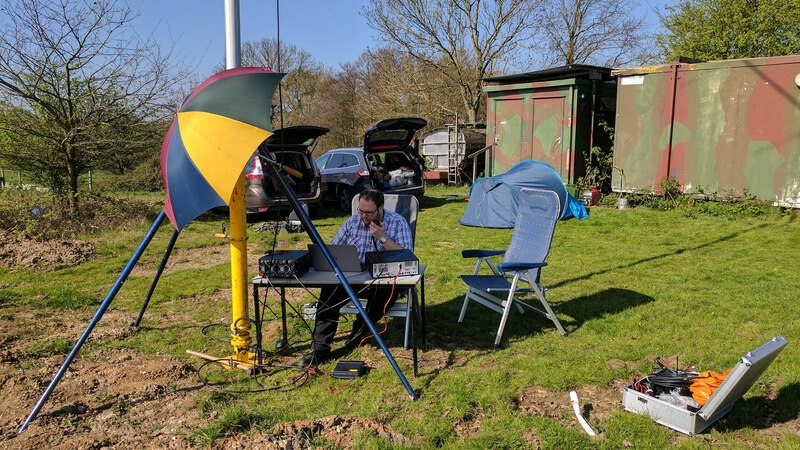 Charlie M0PZT had once again applied for the special call GB0 ST Georges day, and the location was Gallywood common just South of Chelmsford. 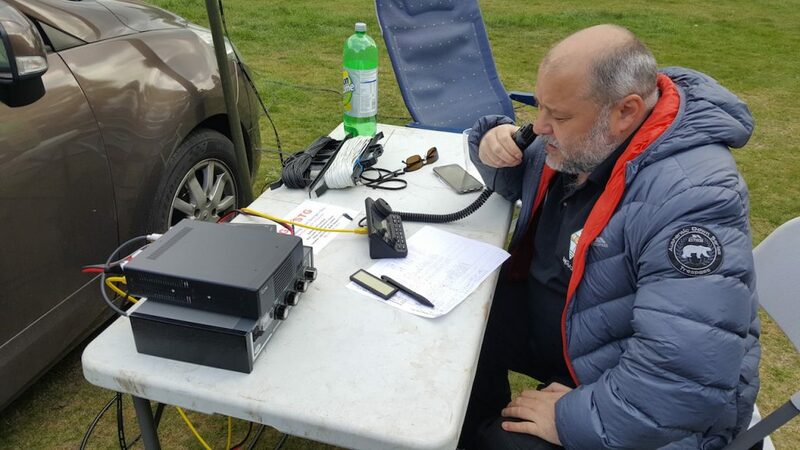 The weather was better than expected, and this encouraged lots of Essex Ham members to attend and play radio. I counted 7 active stations, these included at various times 144 MHz FM and SSB, 70 MHz, 18 MHz, 14 MHz, 7 MHz 5 MHz, and 3.5MHz So you could say we had most bands covered. 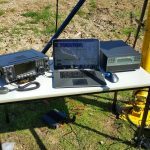 I opted to start on 70 MHz using a 1/2 wave and some push-up poles. The furthest distance on 70 MHz was down into the Gatwick area around 50 Miles. Once I had worked everyone I could hear I then migrated to 5 Mhz using a low doublet antenna. 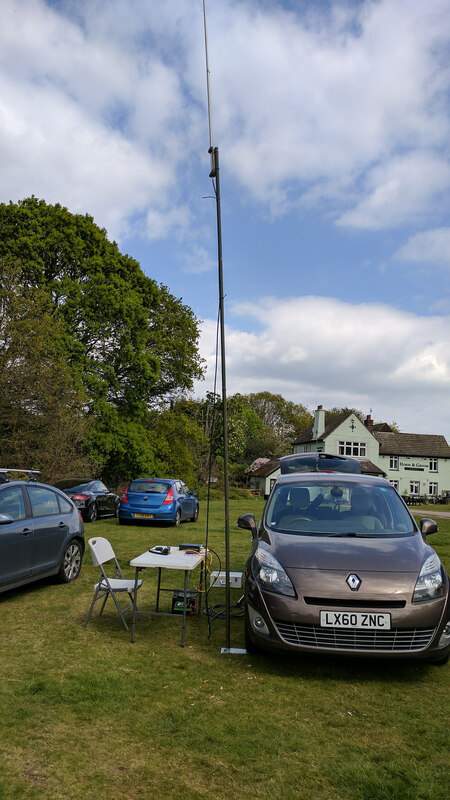 tree and ready to work some inter G. The band conditions were a little depressed, once again a solar flare had caused some disturbances, but 5 Mhz did provide reliable contacts as far north as Scotland and all over the UK. 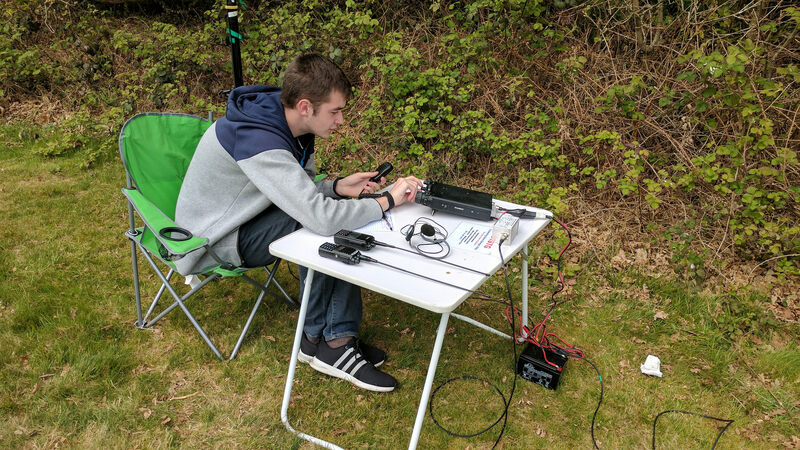 Signals were especially strong from Devon and the South Coast. 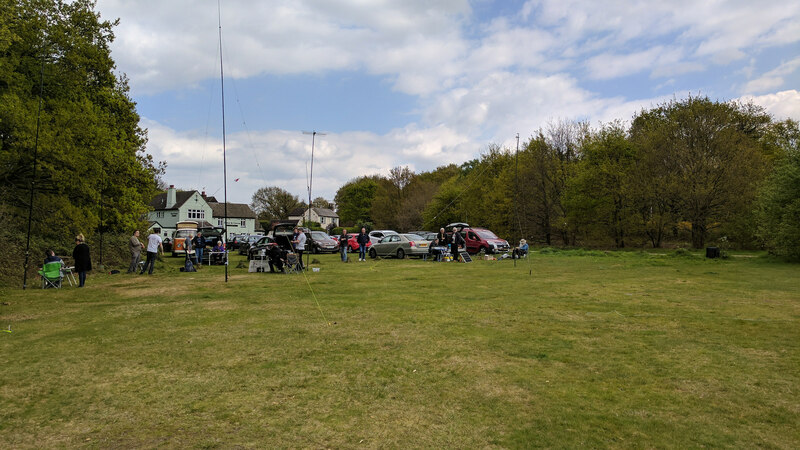 It was nice to see so many people operating portable, every station battery powered. 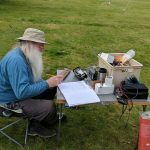 I operated from 1130 to 5 PM using a lead acid leisure battery and the Icom 7100. 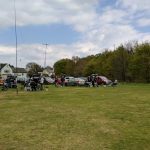 Special thanks to Peter M0PSX and Charlie M0PZT for organising the event once again. You can follow Essex Ham on twitter or their website. 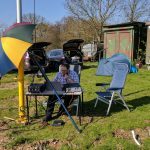 During the long Easter weekend members of the SNBCG came together for a radio weekend. Over the course of the weekend, we had two HF stations set up one on 7 MHz and the other roaming between 1.8 and 21 Mhz depending on propagation. 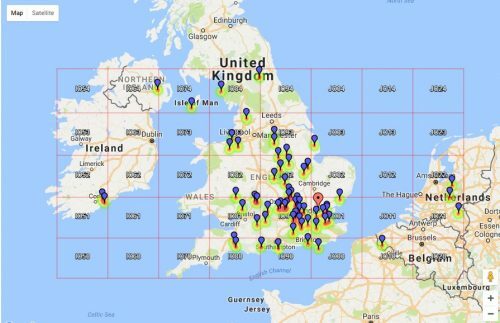 I decided this weekend I would like to try a 1/4 wave vertical on 7 MHz and utilise my recently purchased push together plastic poles. 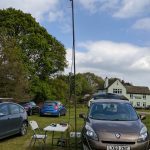 The push together green poles are often sold at radio rallies and come in packs of 5 (each pole 1.3 meters) to give you an overall height of 6.5 meters. 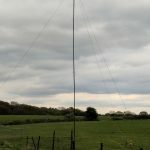 Using two packs of the poles I could achieve the required 10 meters. 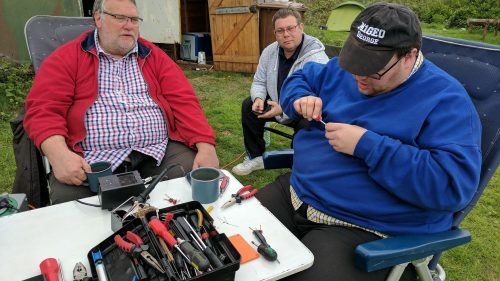 Chris G8OCV had made some supporting guy rings, these provided anchor points for the guy lines at approximately 4 and 8 meters. 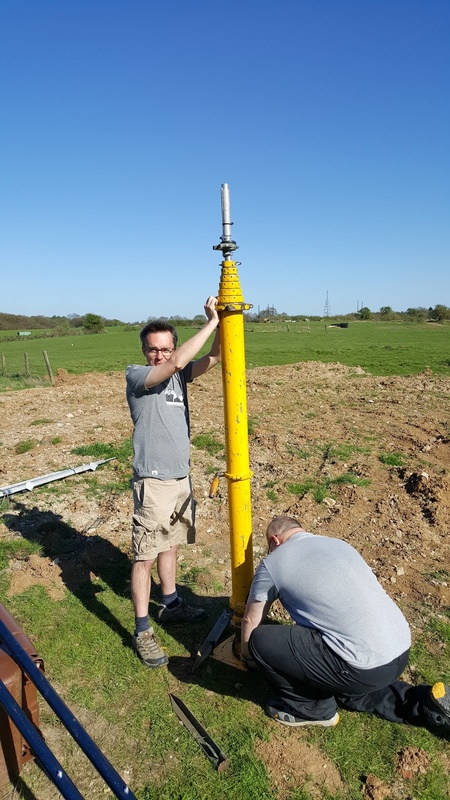 The first attempt didn’t quite go to plan, it simply wasn’t possible to walk up the 10m pole, as we found out when we exceed the bend radius of one of the poles. 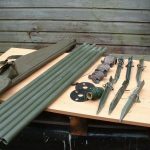 Lesson learned it didn’t make any difference as the fracture was in the joining section that was simply moved to the first section. 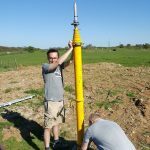 In the end, we used 9 poles, giving us a total height of 11 meters with a simple wire running down the side for the radiator. 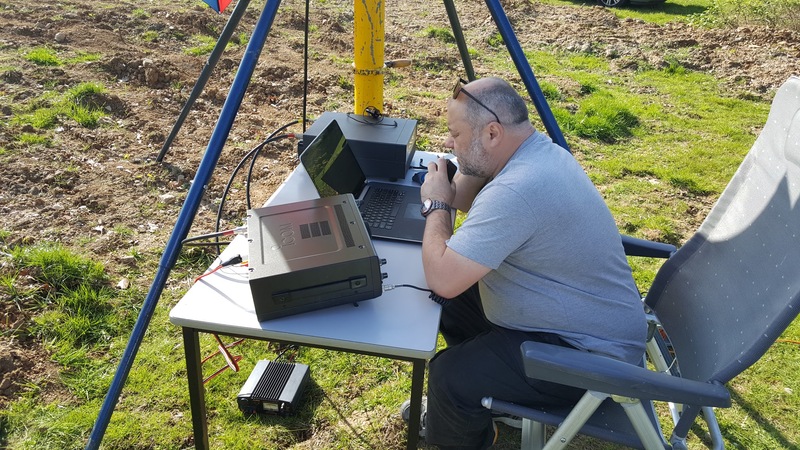 I also cut 6 radials, each around 10 meters in length and the antenna was mounted at the base of a wire fence. 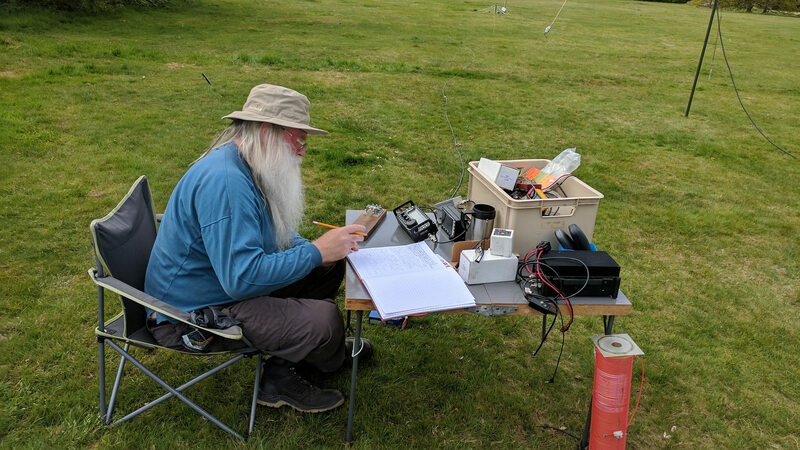 The earthing system included the 6 radials and the wire fence, and this provided a reasonable match around 1.5:1 at 7.150 MHz. 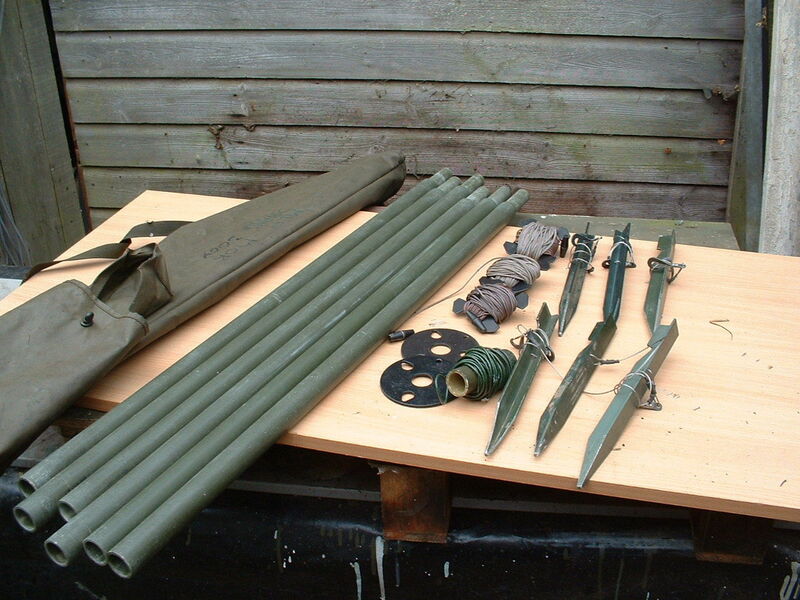 It would have been much easier to use a push-up fishing/roach style pole but experience has told me these can be tricky to keep up without guying and some tape over the joints. 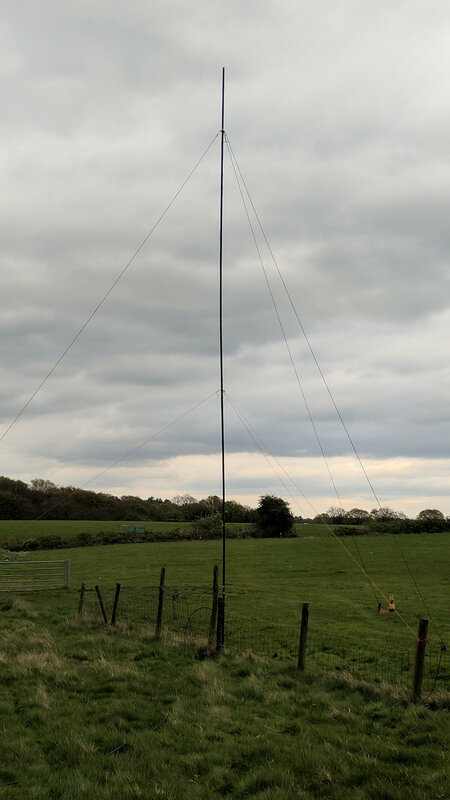 I wanted to use the linear amplifier this weekend, and the prospect of the pole moving in the wind and or falling down made up my mind to use the push together poles as the first choice. The antenna was fed with coax with a 1:1 balun (FT240-31) at its base to stop the coax radiating, and this needed to be capable of high power. 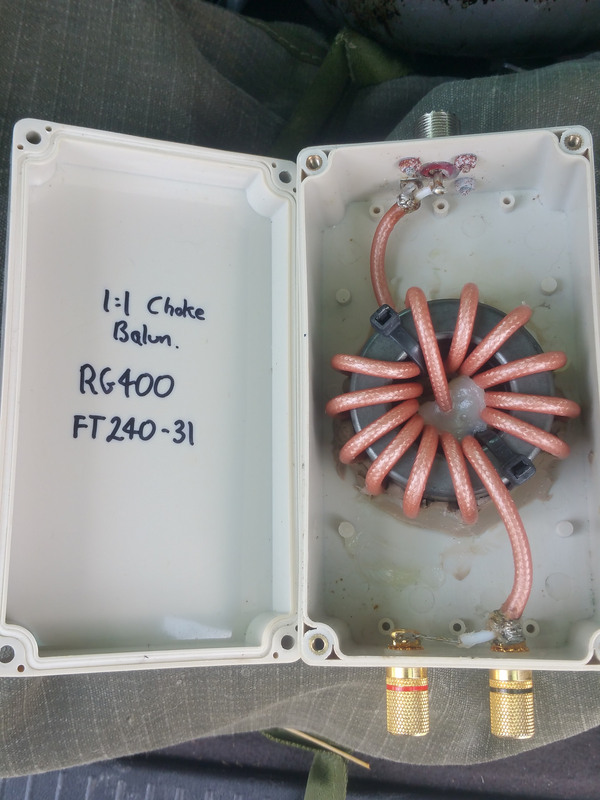 John M0UKD made up the balun a couple of years ago after sourcing the parts online. 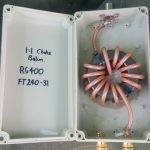 I understand the RG400 coax can be quite expensive and difficult to obtain in small quantities, although any PTFE coax will suffice. 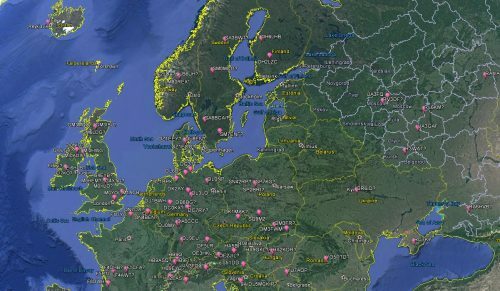 The antenna provided reliable service all weekend, and with the addition of 400w provided over 200 contacts in 40 DXCC countries. 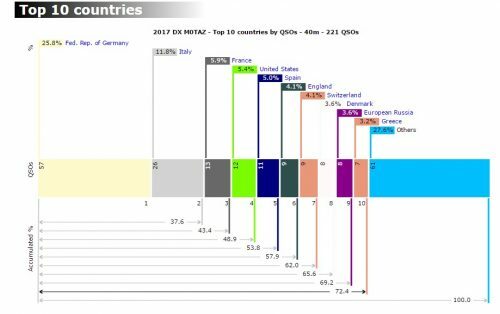 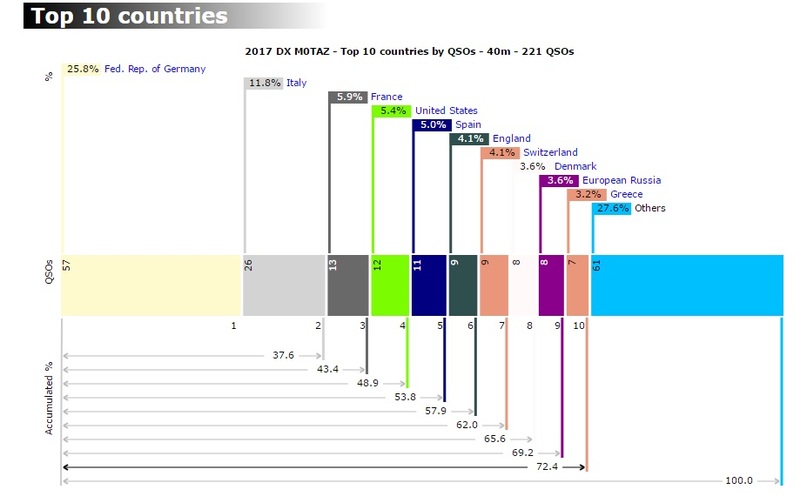 The highlight for me was working DX stations later in the evening, these included the USA, Chile, Mozambique, Guinea-Bissau, Israel, UAE, Armenia and Asiatic Russia. 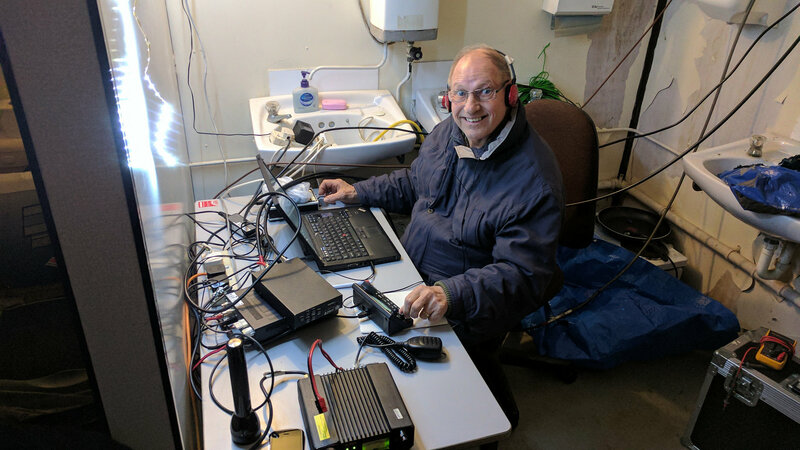 George M1GEO and Fred G3SVK operated the other station, George chased some good DX and Fred worked several hundred stations as GB0SNB in his mode of choice CW. 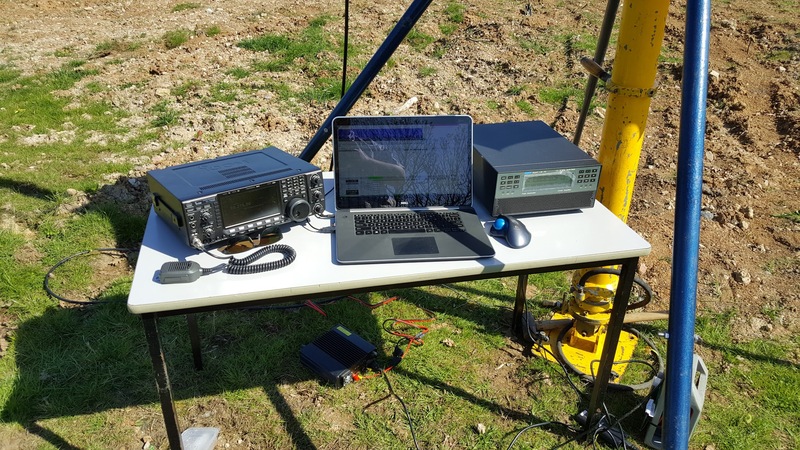 Dave M0YOL worked some data modes using his portable setup. We also had time for a BBQ and some excellent curries provided by Fred G3SVK. 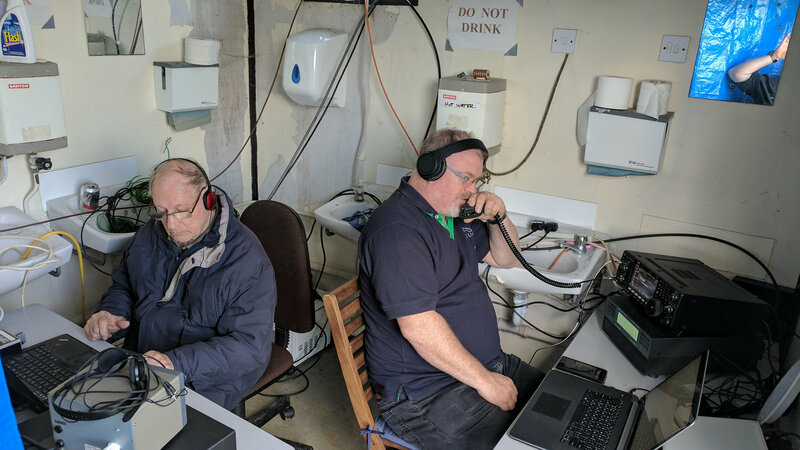 It was nice to see Camb Hams members Geoff G0DDX and Linda G0TPX, and LEFARS members Derek M0XDC, Dave M0MBD. 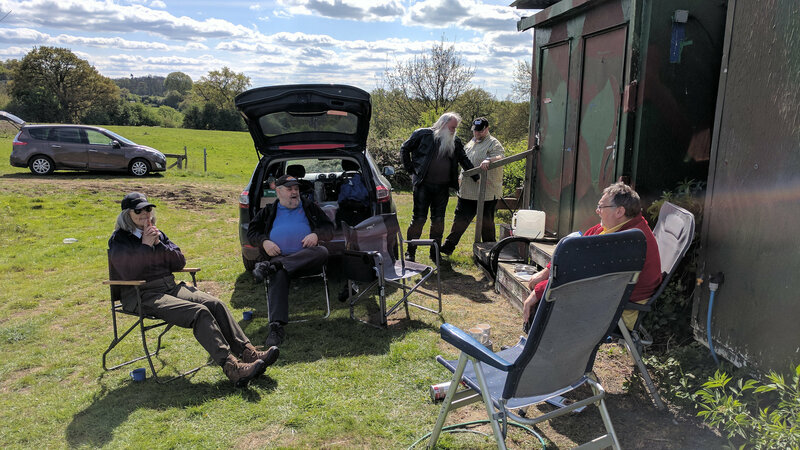 Peter Onion G0DZB also joined us for the afternoon, making the most of the good weather for a ride on his motorbike.